Start investing for them as soon as they are born (if you can afford to). FI/RE is an invaluable gift and legacy to leave behind. This post is not intended to make other parents who are barely getting by feel bad that they cannot afford to invest for their children. It is to explain why and how we do it, with the hope that it is at least considered as and when budgets allow. Before I write about how we actually invest for our children, I guess the first point would be to quickly talk about why we chose to do this. There is always going to be the risk that our children might grow up to be financially irresponsible, mix with the wrong crowd or their teenage rebellion phase end up being a lifetime one. This means all the money we have decided to invest for them in their own names could go to waste on the FOMO and YOLO lifestyle. Whilst we recognise these risks, we believe there are benefits of investing for them. Where the actual money is in their own names, giving them a sense of real ownership and personal responsibility to learn how to invest when the time is right. Perhaps this might even provide them with the incentive and motivation to take an active interest in it much sooner than if it was something abstract and saved away in an account in our own names. They could see the investment statements with their names on there and they could even execute a deal themselves when they are old enough to understand using saved up pocket money. They could see the value of their investments can go up as well as down. Learn to emotionally cope during periods of negative returns and hopefully recognise that the longer term trajectory is upwards. All this might not happen until their late teens and there is a lot of foundational work which needs to happen before then. When I was in my teens, I didn’t understand what a mortgage was nevermind an index fund. If our children can start to invest at that age, they would be way ahead of their peers in terms of financial literacy. I know, I’m getting ahead of myself here. Before all this, I hope that as they grow up, they will see how as a family, we manage our money. Where appropriate, I would be trying to spot opportunities to teach them a thing or two about personal finance. It’s always going to be a difficult balancing act with kids. Recognising the right time when they are mature enough to understand the topic at hand but at the correct moment when they are willing to learn. I must remember not to come across as being preachy as it would only increase the chances of them rebelling. It’s going to be tough. When I believe in something and can see the life-changing benefits it could have on our children, I can imagine myself slip into preachy dad mode without realising. Time will tell whether I get this right. We currently have one child, a 20-month-old son. Far too young to be talking about money with him and not long ago would have just shoved it all in his mouth. Our intention as he grows older is to start to show him and any other children we have how open our family is when it comes to money. My parents never discussed our household income or expenses. I only really understood how much money it cost to buy groceries let alone household utilities when I went to university. I think I would have gained a lot by understanding all this much younger. It would have helped me become financially responsible sooner if we all sat around the dinner table once a month to go through the family budget together. It’s called a family budget for a reason. It should be inclusive, involving the parents and the children. Such conversations should not be kept exclusively for ‘the adults’. Yes, investing the money in our own names as opposed to in our children’s name would be the safest and simplest option. As someone who strives to mitigate my risk exposure, such a strategy would make sense. But at what cost? It would send the wrong message: that somehow as parents, there is a part of us that don’t fully trust our children enough or have enough faith in our own abilities as parents. What impact will this have on their own self-confidence growing up? Could it be a self-fulfilling prophecy where our potential lack of trust in them causes us to unconsciously behave differently towards them in the years ahead? Could this, in turn, lead them to financially rebel? I don’t claim to have the answers to these questions. However, I just feel happier knowing that I place my trust in them and that everything will turn out alright. If it doesn’t then I’ve made sure I have not invested money I could not afford and know I’ve done everything with our children’s best interest at heart. C’est la vie. There is also the psychological factor to consider. Would I pay as much attention to learn or try to invest as much as I can if I knew the money was put into an account belonging to someone else? For me, the answer is a definite NO. I guess most people wouldn’t either. The same would apply for children, especially as they get older. Unless you have some incredible self-control, for us, there will always be the temptation there dip into the money set aside for them if it were saved in our names. Or, there might always be that emergency situation which we justify to ourselves as being okay to use their savings and promise to top back up in the future. Why not avoid this altogether and invest it in their names? It is likely that our networth will mean inheritance tax will play a part. Investing in their names will help minimise any inheritance tax in the unfortunate event one or both of us die. This is because money that is in their names do not form part of our estate. First of all, not everyone can invest for their children because the budget will not allow for this. 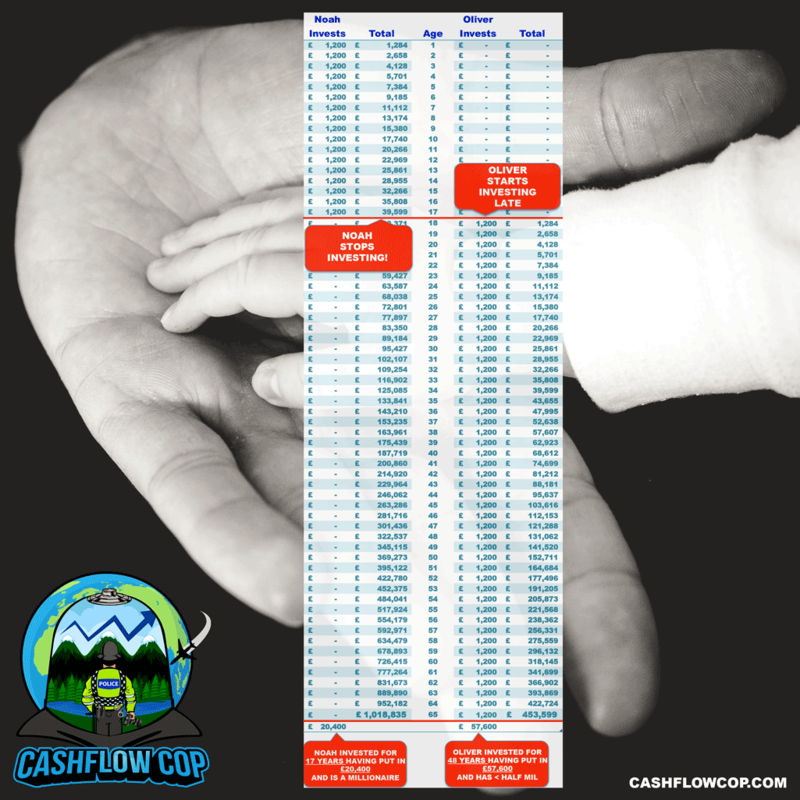 I am just explaining how the Cashflow Cop family does things. As always, do your own research. Ever since our son was born, we opened a JISA (Junior Individual Savings Account) and a SIPP (Self-Invested Personal Pension) for him. Read the differences between a JISA and a SIPP here. We invest a total of £150 per month for him (£125 from our after-tax income plus £25 tax relief). Most of the money is invested into his SIPP rather than JISA. There are pros and cons to each type of our account. Ultimately, we wanted to save the money for his later years, allowing more time for it to grow and also prevents the temptation of early access. The money in the JISA can also help towards education or a house. We may change this allocation as time progresses and we re-evaluate what we think needs prioritising. It is likely we will reduce their SIPP contributions and increase the JISA contributions in due course since the trend is that state pension ages are increasing. SIPPs can currently be accessed at state pension age minus 10 years but this could change and will likely change in the future. Again, pros and cons. We have gone with HL (Hargreaves and Lansdown) as a platform for ease of use and simplicity. There are cheaper platforms out there. Our intention is to move to the Vanguard platform once they offer a SIPP. There are other blog posts which go through a step by step process of how to invest on various platforms so there is no point me repeating things here. Just Google it. We invest £25 per month into his JISA into the Vanguard Life Strategy 100% Accumulation index fund (LS100). We invest £100 per month into his SIPP topped up to a total of £125 per month due to tax relief. This is invested in LS100 and the Vanguard Emerging Markets Stock Index. Who knows how the markets will perform over the next 5 years let alone the next 60 years or so when our son can access his SIPP or 17 years when he can access his ISA. However, by the time he is 18 years old, he might have £11,133 in his ISA and £55,666 in his SIPP. This gives a total net-worth at age 18 of over £65k. If we decide to stop all contributions at 18 and just leave the money as it is in his account, by the time he is 60, he might have £232,149 in his ISA and £1,181,620 in his SIPP, giving a total net-worth of over £1.4 million. As a side note, if he were to continue investing himself a very moderate £125 net per month (£150 gross with tax relief), i.e. continue contributing in the same way we are doing for him now up until he is 60, then his net worth would be around £1.8 million. This is just over £400k more compared to stopping at 18 but requiring 42 more years of contributions. This goes to show the effect of compounding and the value in starting early. All this assumes a 7.5% annual return which may or may not materialise. Given the extremely long time horizon of 60 years, unless the world falls apart which means we have more important things worry about, I think it’s pretty safe to assume a 7.5% return. You can play around with compound interest calculations here. I admit, a million or two in 60 years time will not be worth as much as it would do now. It all depends on the rate of inflation over that period, but if that is the takeaway you get from reading this, then you’ve sadly missed the point. The bottom line is this. We invest as much as we can afford to. Whilst the rate of inflation is important, it is not within our control. What is within our control is whether we invest, how much we invest, the frequency of our investments and what we invest in. It is extremely unlikely that our children’s investments perform so poorly over the next half a century that overall, the rate of inflation is higher than their returns. If it does happen, and that’s a big if, then they would still be in a much better position than having no investments at all or started when they were much older. We would do the same for each of our children to ensure a degree of fairness and would hope that it gives them a head start in their own FI/RE journey. If they were to continue investing monthly and save aggressively from their very first paycheck (50+%) which I sincerely hope they do, then reaching FI/RE with a seven-figure networth before they are 40 years old is within their reach. As parents, we will need to instil some good money habits for them, maybe even some brainwashing, but it will all be worth it. The following info-graph illustrates clearly the power of compounding with £1,200 invested a year for your children early (assumes a 7% annual investment return). Note how Noah only needs to contribute for 17 years compared to Oliver yet his wealth is more than double. With all the free resources available (see list below), I believe we are in an era where it would be inexcusable to bring up children without trying our best to give them a financial education. We’ll have to wait and see whether or not what we’ve chosen to do will ruin or motivate them. It could make them complacent, lazy and spoilt. Equally, it could inspire, motivate and educate them. We would not be on this FI/RE journey if we weren’t optimistic about the future, so it would make sense to think positively about this also. We need to continue to lead by example. Children learn first by observing what adults do. These early years are vital both in terms of the money habits that they will take with them through the adult years, but also the compound interest that could be earned. We’ve invested all this time and money to reach FIRE. Putting aside a small portion of that coupled with making them financially literate is the least we could do. It will allow them to embark on this journey with something already in their back pocket and equipped with the vital knowledge to make it grow further. The investments we make for them gives them a helping hand, but it is the knowledge and good habits we part onto them which is essential. Teaching them the path to financial independence in order to live the life they want is, in our humble opinion, one of the greatest gifts we can give our children. One which we hope that they pass on to future generations and use their wealth to positively impact the world. 23/11/18 – for clarification based on feedback. 20/04/19 – added an info-graph. can I ask what platform you use for monthly JISA investments? Hi Ed. I use HL (Hargreaves Lansdown). Not the cheapest but we are still waiting for Vanguard to offer SIPPs so we can transfer everything over in one go. For our own investments, we also use Fidelity, via Cavendish for non Vanguard funds as I’ve found them cheaper based on the amount and frequency which we invest. We still intend to keep HL for our LISA though. Monevator also do a useful platform compare if you haven’t come across it yet. Link here. Hope that helps. Thank you for reading. I use Vanguard for our ISA but not moved the JISA over to them yet. Thought I might as well wait and get all the paperwork done in one go with the SIPP. The Vanguard online platform for the ISA is basic but very simple to use. HL is fancier but I guess that’s what we pay for as a result of the higher fees. Let me know which one you end up going for. I’d be interested to see how the JISA operates in Vanguard – hopefully, it is exactly the same as their ISA. Also be interested to know if they allow accounts to be linked so I can log into my own account and also view my children’s accounts to save time logging into multiple accounts.